Try Charmin Flushable Wipes, now with a re-sealable flip top to keep your wipes moist and your hiney Charmin-shiny. They're flushable and safe for your sewer or septic system. Plus, the stylish packaging looks good wherever you decide to put it or wherever you take it. Thats because this little soft pack is hugely portable, so you can take it with you, to enjoy the go, on the go! Pair with your favorite Charmin TP for an extra clean finish because those who go with Charmin Flushable Wipes really enjoy the go! Cottonelle FreshCare Flushable Cleansing Cloths Clean Ripple.Safeflush technology*.Designed to clean better.Using dry + moist together vs. dry alone.1 Dispenser + 42 Cloths.7.25 X 5.0 in. (18.4 X 12.7 cm). 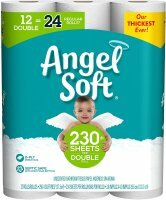 Angel Soft Unscented Bathroom Tissue Softness & Strength.An ideal Balance Of Softness & Strength.4 double rolls = 8 regular rolls.60% more sheets per roll.Than Charmin Ultra Strong**. Charmin Ultra Soft Toilet Paper Double Rolls.6 double rolls = 12 regular rolls.Use up to 4x less!Irresistibly soft & absorbent so you can use less!Clog safe. Septic safe.vs. Charmin basic **vs. leading bargain brand (USA), vs. the bird brand-ply (Canada). Our proprietary technology produces a super-flexible paper designed to hold up.And with two soft, durable layers, you don't have to choose between comfort & strength. Our patented technology delivers the softness you want while cutting down on what you don't(lint!). And with three silky soft layers, you get the ultimate in comfort. Scott Tissue 1000 Sheets Unscented Bathroom Tissue gives you the long-lasting quality you want in 1,000 septic safe sheets. Get the performance and long-lasting rolls with the value you expect. Comfort where you want it. Made just right with an extra layer (versus one-ply products) to get the job done. Septic safe. Safe for standard septic and sewer systems. Made in U.S.A. The First Years Take & Toss 4 Sippy Cups 9+.Use again and again.Tomy.Spill proof. Bush's Best Onion Baked Beans. Since 1908.Seasoned with bacon, brown sugar & onion.98% fat free.High in fiber. See nutrition information for sodium content.28 oz (1 lb 12 oz) 794g. This [yellow tail] Sauvignon Blanc is everything a great wine should be fresh, crisp and easy to drink. Each pouch in this value pack delivers 2 servings of organic fruit, exposing your little foodie's taste buds to new flavors and nutritious foods. McCormick Gourmet Collection Cayenne Red Pepper. 100% organic. Fritos Brand Scoops! Brand Corn Chips.Party size!Great for dipping.Chips enlarged to show texture.Guaranteed fresh until printed date. Since 1970. Fights cavities. Whitening. Fresh breath. Helps fight tartar. Sometimes you need a little extra power in your oral care routine! Whole Care toothpaste offers just that! Along with clinically-proven cavity protection from fluoride, this toothpaste whitens with natural silicas and helps fight tartar with naturally-occurring zinc. Embrace the power of Mother Nature with Tom's of Maine Whole Care toothpaste! What makes a product good? At Tom's, it includes how we make it. No animal testing or animal ingredients. Sustainable practices are a priority in every aspect of our business. No artificial colors, flavors, fragrance, or preservatives. Made in USA. Each slice is loaded with wholesome ingredients, like whole wheat, sunflower seeds, oats, barley and brown rice for delicious layers of flavor and nutrition. Life Savers 5 Flavors Hard Candy.Individually wrapped.Cherry.Raspberry.Watermelon.Orange.Pineapple. Gillette Comfort Glide Formula. Gillette Foamy Regular has a thick, extra rich creamy lather for a close, comfortable shave. Spreads easily, rinses clean leaving skin feeling soft and smooth. No CFC's. GG saves us time and money when we visit wdw, plus we eat a lot better and feel more healthy.